U.S. District Court Magistrate Judge Thomas Coffin ruled that Chevron has made "unduly burdensome" demands for information from ELAW. 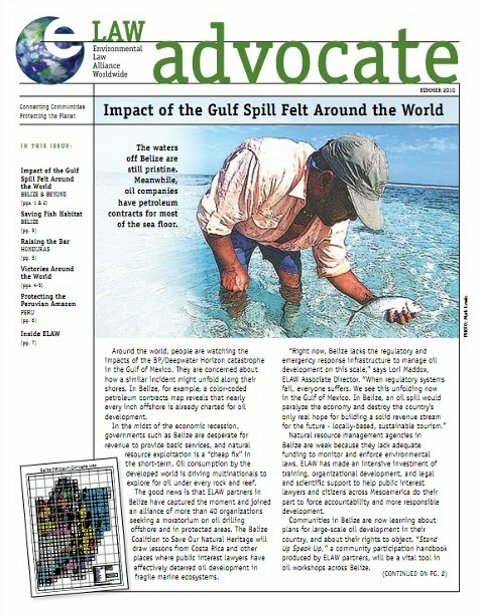 ELAW eBulletin A federal court judge ruled that Chevron made "unduly burdensome" demands for potential evidence from ELAW. This order comes in connection with a case seeking justice for communities in Ecuador suffering the effects of oil pollution. 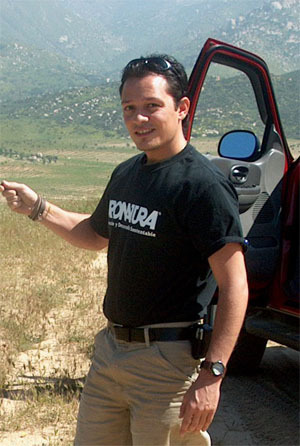 ELAW Advocate Winter, 2011: The Government of Peru has divided more than three quarters of the Peruvian Amazon into oil block concessions. 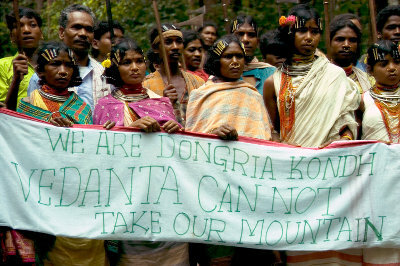 Indigenous communities that have lived in these tropical forests for hundreds of years now face the prospect of their ancient lands becoming oil fields. 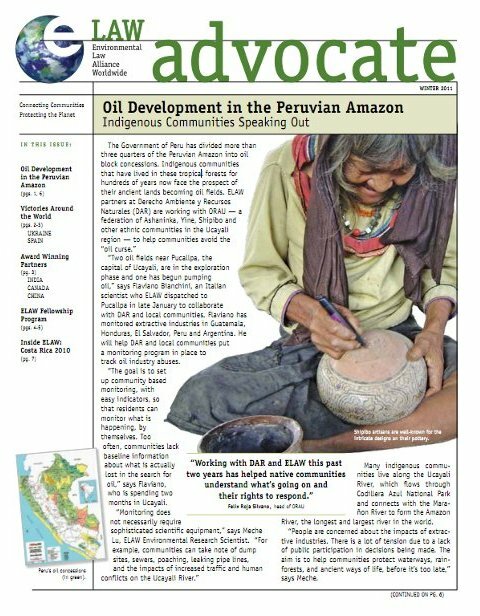 ELAW partners at Derecho Ambiente y Recursos Naturales (DAR) are working with ORAU — a federation of Ashaninka, Yine, Shipibo and other ethnic communities in the Ucayali region — to help communities avoid the "oil curse." 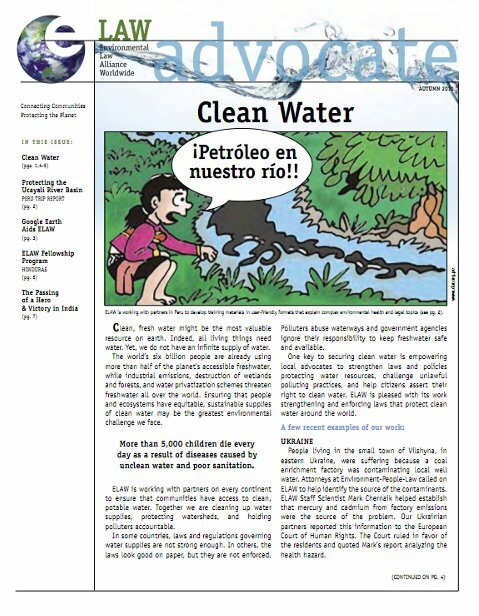 ELAW Advocate, Autumn 2011: Clean, fresh water might be the most valuable resource on earth. Indeed, all living things need water. Yet, we do not have an infinite supply of water. The world’s six billion people are already using more than half of the planet’s accessible freshwater, while industrial emissions, destruction of wetlands and forests, and water privatization schemes threaten freshwater all over the world. Ensuring that people and ecosystems have equitable, sustainable supplies of clean water may be the greatest environmental challenge we face. Nine international ELAW visitors had the opportunity to tour NextStep Recycling's successful electronic equipment reuse and recycling facility. ELAW and the Ems. ELAW will be the Featured Nonprofit at the Eugene Emerald's baseball game on August 4th. 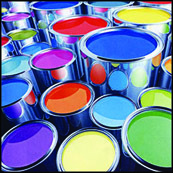 You can take part in a Eugene tradition and support ELAW. ELAW Advocate, Summer 2011 After two decades, ELAW is now celebrating the arrival of the next generation of environmental leaders. 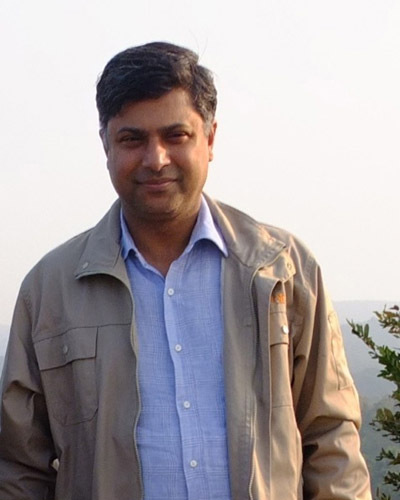 ELAW partner Kenneth Kakuru from Uganda founded Greenwatch. His daughter Samantha is now on staff. Raquel Gutierrez has dedicated her life to protecting Mexico's Lake Chapala. Her son Pedro has joined her organization. Harper Johnson, daughter of ELAW Executive Director Bern Johnson, is one of many young ELAW volunteers with a passion for protecting the planet. 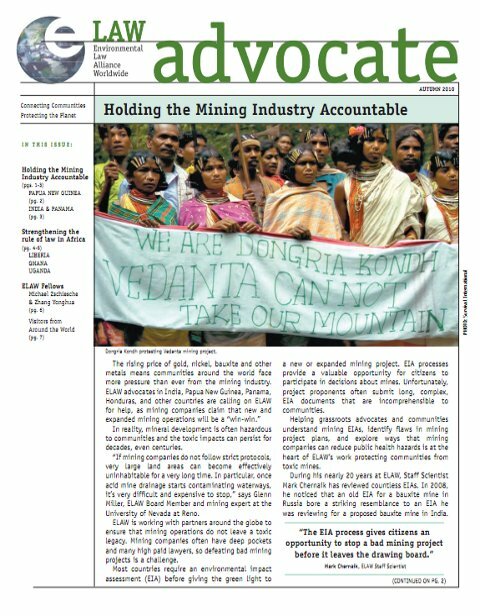 ELAW has built an international corps of environmental defenders — 300 strong in 70 countries. We now welcome Samantha, Pedro, Harper, and the many others who are carrying on the important task of building a sustainable future, for all the world's children. 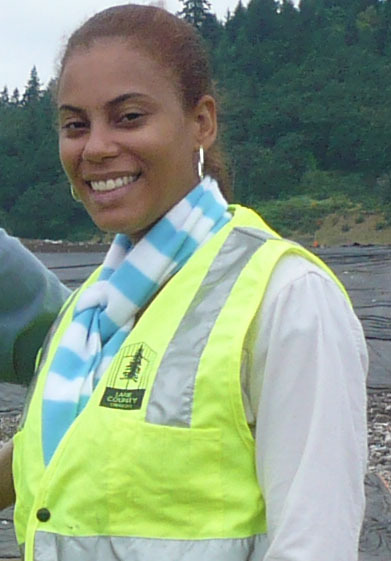 ELAW welcomes Maria Rosario Mayi to Eugene for a ten-week Fellowship. Maria works with the Dominican Republic's leading grassroots environmental law organization: Instituto de Abogados para la Protección del Medio Ambiente (INSAPROMA). ELAW Partner Asis Perez took the oath of office today as new director of the Bureau of Fisheries and Aquatic Resources, the agency responsible for the improvement, management and conservation of the Philippines’ fisheries and water resources. 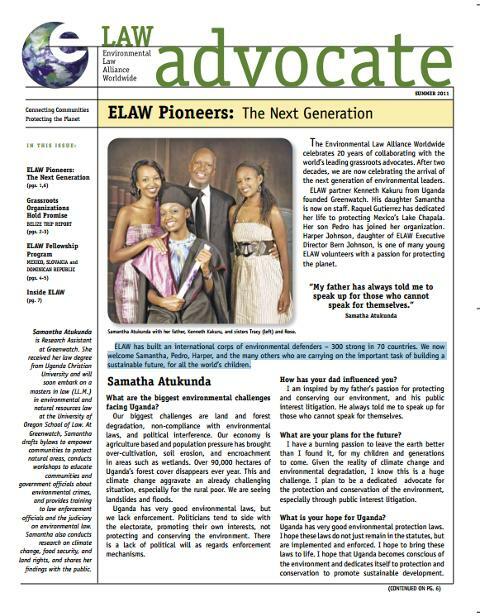 ELAW Advocate, Spring 2011 Our hearts go out to the people of Japan who are struggling to recover from the twin blows of an earthquake and tsunami on March 11. The disaster around the failure of the Fukushima nuclear facility continues to unfold. The recovery effort will continue for decades. We have worked with partners in Japan for many years, to protect communities and the environment. We recently contacted a few of these partners, to extend a hand and express our sorrow. The responses we received moved us, deeply. Naoki Ikeda, an attorney at the Osaka Branch of the Japan Environmental Lawyers Federation, gave us permission to share his response. E-Bulletin We are saddened by the tragedy in Japan and our hearts go out to Japan's people. 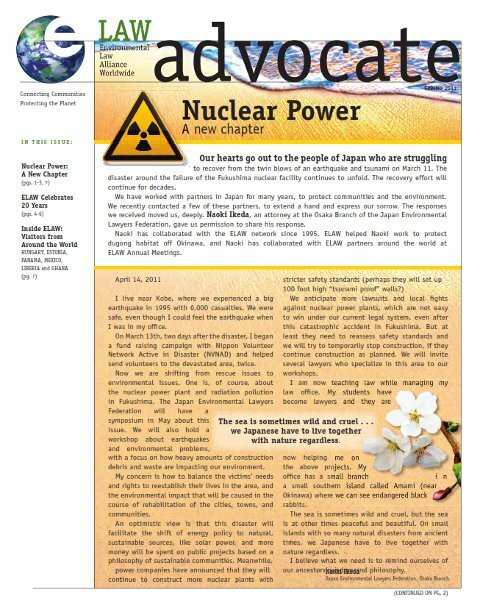 This painful event has opened a critical dialogue on the safety of nuclear power. 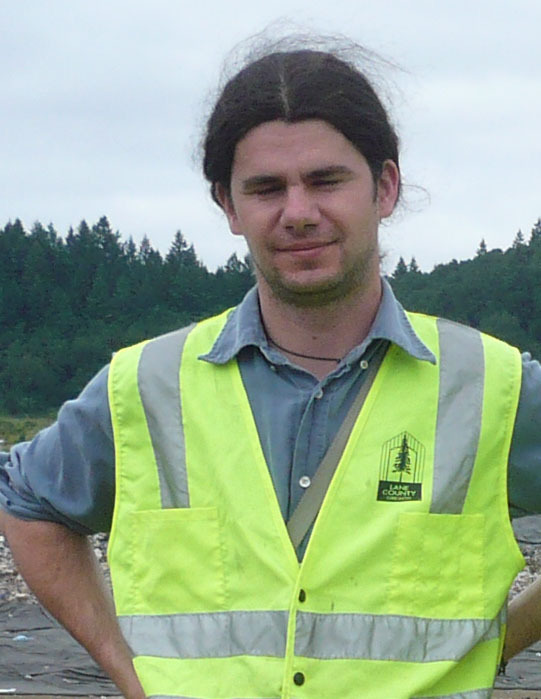 Read a "Guest Viewpoint" by ELAW Staff Scientist Mark Chernaik in today's Register-Guard. ELAW Fellows from three continents arrived on Monday to work with us to protect communities and the environment, and to participate in the 2011 Public Interest Environmental Law Conference. Yesterday, we toured NextStep Recycling, a model for e-waste recycling. FOR IMMEDIATE RELEASE: Leading environmental attorneys from Africa, Asia, the Americas, and Central and Eastern Europe will tour NextStep Recycling’s model facility in Eugene for managing electronic waste. 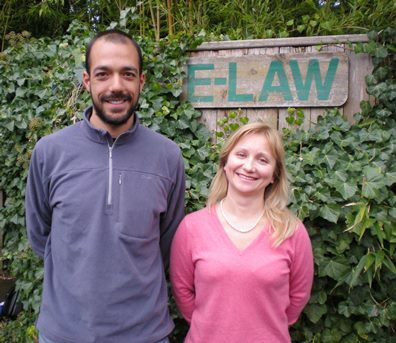 Join us in welcoming Olena Kravchenko and Flaviano Bianchini, ELAW's first Fellows of 2011. 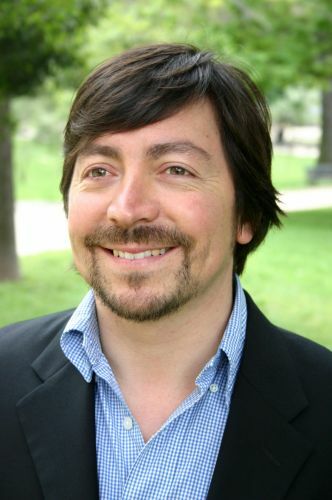 Olena is the Executive Director at Ukraine's leading environmental law organization and Flaviano is a scientist with field experience monitoring extractive industries. The world's leading grassroots advocates gathered in Punta Leona, Costa Rica for the 2010 ELAW Annual Meeting. They collaborated on new solutions to problems stemming from coastal development, climate change, use of water resources, mining, oil development, and more. 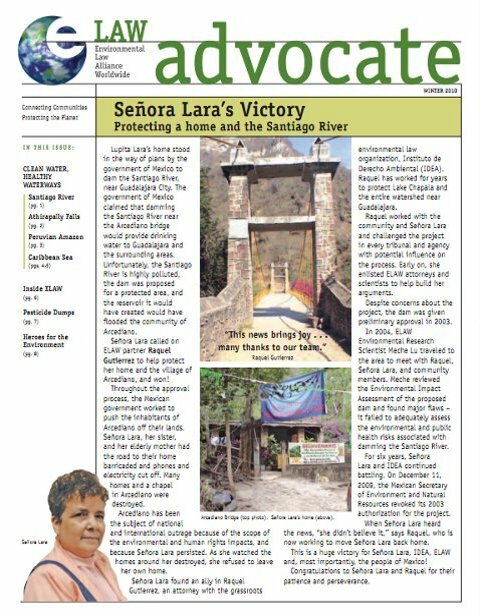 ELAW Advocate, Winter 2010: Lupita Lara's home stood in the way of plans by the government of Mexico to dam the Santiago River, near Guadalajara City, which the government of Mexico claimed would provide drinking water to Guadalajara and the surrounding areas. Unfortunately, the Santiago River is highly polluted, the dam was proposed for a protected area, and the reservoir it would have created would have flooded the community of Arcediano. Señora Lara called on ELAW partner Raquel Gutierrezto help protect her home and the village of Arcediano, and won! Welcome newest ELAW Fellow, Yonghua Zhang! We are pleased to welcome Yonghua Zhang, ELAW's Laurie Prosser/Xiaoli Jiang Fellow. Yonghua is an environmental attorney from Shenzhen, China. He works pro bono at the Shenzhen Legal Assistance Center to clean China's air and water, and challenge noise pollution. 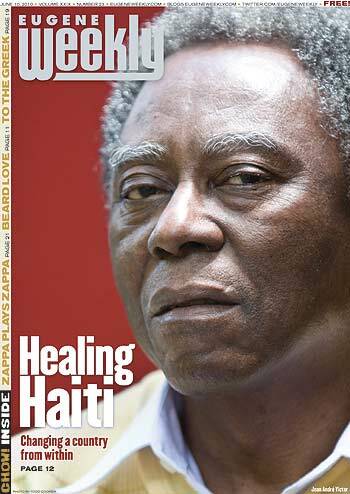 Jean André Victor returned to Haiti where he is drawing on decades of experience, as an agronomist and a lawyer, to help turn things around.